New Comics Ready To Go! Smaller #1 and Flung #4 (the first issue of Flung in many a moon) are both printed and ready to go. I’ll have them with me at the Stumptown Comics Fest (table #101) – if you’re there, stop by and say hi! They’re also up and available for order on my comics store – grab them and some older Flung issues or minicomics! 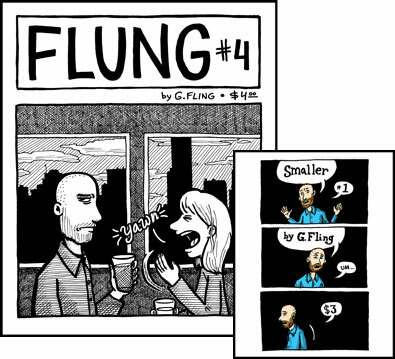 (Original copies of Flung #1 and #2 and most of the minis are just available until I run out, so get them while they’re around.) Thanks!